The world in 2018 is different than in 2017 and much different than in 2000. And our safety also means something different over the time. With the most of the world connected, the information can be a gold, but also a weapon. We all heard about Cambridge Analytica and US election case, we’re constantly affected by Fake News misinformation, our private data is worth more than ever before. For many people Marks’ words “we will make mistakes, they will have consequences, and we will need to fix them” won’t be enough. We need to act proactively to minimize abuse of data protection and manipulation. But from all those bad things around information, there are also good lessons for us. While Internet stopped being a place for hi-tech nerds a long time ago, many people still don’t understand the power of data. That’s why big failures like data breaches or manipulations at the global scale make us more aware of how important is to protect our privacy and be independent in thinking. We need to face the truth. The world never goes back. Even when, in the darkest scenario, someone cuts off Facebook’s cable, there are and will be others. Because people will still demand faster and better ways of connecting and interacting with each other. Today at least there is a person standing in front of us and telling about fighting fake news, protecting election or our data privacy. Should we trust him? It’s a question that each of us needs to ask ourselves. But at the end, no matter of the answer, we need to remember that those problems aren’t only Facebooks’. They are ours, the humanity. “Our goal is to give everyone in the world the power to share anything they want with anyone, anywhere”. While Google talks a lot about being AI-first and building the technology to serve the humanity, Facebook reverses this statement, calling their solutions people-first. When we take a look at 10 years roadmap, it stays consistent, and still very wide. It shows us how complex and diversified can be humans interactions. Especially when you operate all over the world. In some countries, Facebook is a marketplace, in others a political tool. It connects families and friends, groups of interest but also groups of support and compassion — to build a safe community and nurture the power of self-expression. How is Facebook going to cover all of these in the close future? On F8 you could hear about incoming dating app and new ways of sending content via Instagram (now you can share directly to Instagram Stories!). New Groups tab will make it easier for us to be a part of meaningful communities. New features in Crisis Response will give us the possibility to share firsthand information and real-time updates, Blood Donation will make it easier to donate or request for blood in countries like India, Bangladesh, and Pakistan. For better people’s information protection Facebook also did some changes in their 100k+ Facebook Developer Community. 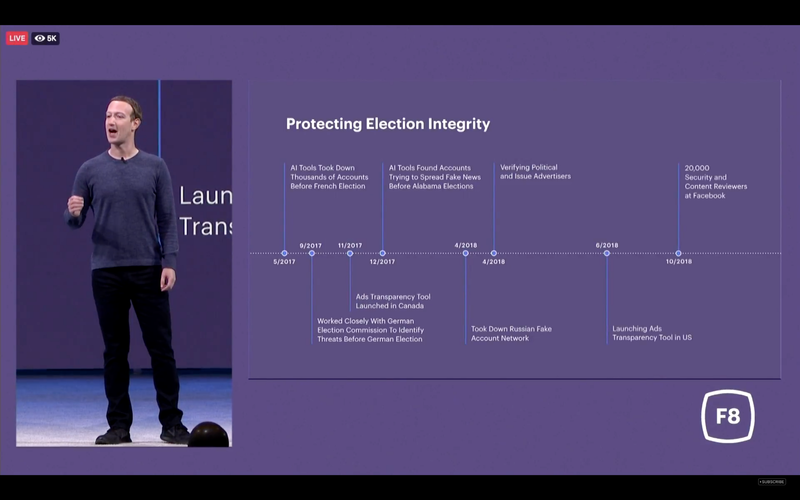 With those operating principles and refreshed app review process Facebook wants to make sure that they move forward in the right direction. What about Messenger? There are 300k active bots (3x more than the last year). Now you can use Built-in NLP solutions to identify intent, automate some of our replies or route the conversation to a human via livechat. And thanks M Translations when you receive a message in a different language M will suggest you to translate it automatically to your default one. Here you can find more about Messenger announcements. And WhatsApp, another part of the Facebook ecosystem. The audience of 450m users from all over the world gets group video calling and stories. It has also become a business tool with the business Android app launched earlier this year (3m users now!). And don’t worry if you aren’t a small business. Soon you won’t need to have dedicated mobile device and dedicated person who answers questions on it. WhatsApp is going to launch separated tool for big businesses. This and many others (Clear History, more AR effects, Oculus Go, 3D posts — including 3D photos and 3D moments) can be found in Highlights from day 1 or the Keynote video. Hear from Mark Zuckerberg and other Facebook leaders on Facebook's latest technology and innovation. Now lets take a look at the technology which lies beneath all announcements. 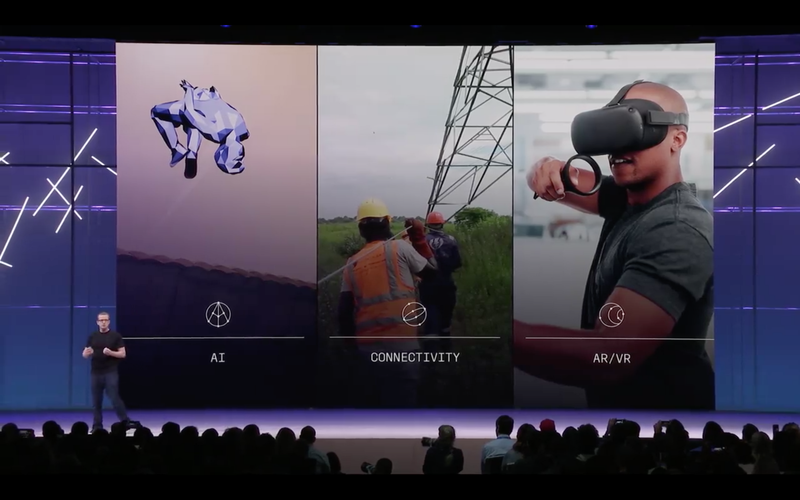 In the Day 2 Keynote, Facebook’s CTO, Mike Schroepfer with the team went through “carefully chosen (…) technology that most likely helps people in the world”, split into 3 areas of focus — AI, Connectivity and AR/VR. Artificial Intelligence, the critical part of everything what is being built now at Facebook has got a new home: https://facebook.ai/. ChatBots, Assistants, AR/VR experience. Picking the content for watch tab, generating video thumbnails, translating between languages. 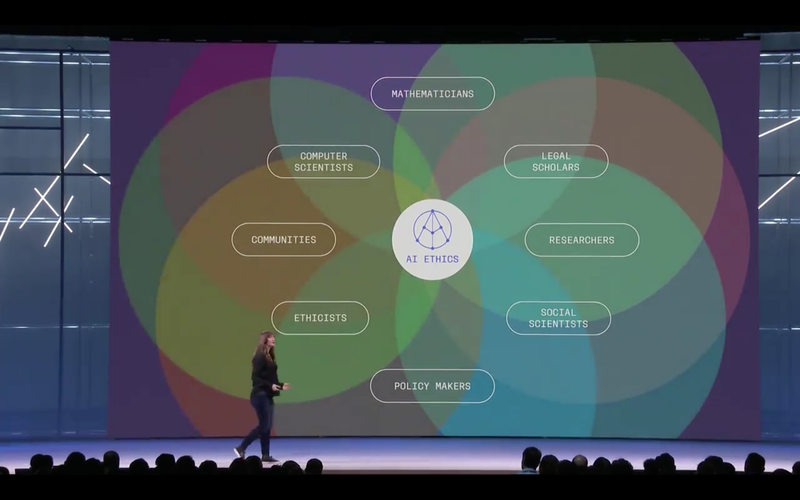 AI is present in almost every part of Facebook. It also includes platform safety. Examples: there are millions of fake accounts removed automatically every day. Almost 2 million pieces of terrorist propaganda were removed in Q1. Without AI it wouldn’t be possible to do it manually by hundreds of people working every day in that time. PyTorch 1.0 — deep learning framework with the stability and support needed for production deployment. Natively supported by Microsoft and Amazon. Caffe2 — lightweight deep learning framework for mobile devices. ONNX — an open format for representing deep learning models to allow moving models between tools like PyTorch, Caffe2, Apache MXNet or TensorFlow. And many others. Just take a look at the official announcements which include tools and research in areas like vision (e.g. 3D mapping), language and learning (e.g. bots playing StartCraft). While those are things built for existing users, in the world there are still 3.8B people without internet access. 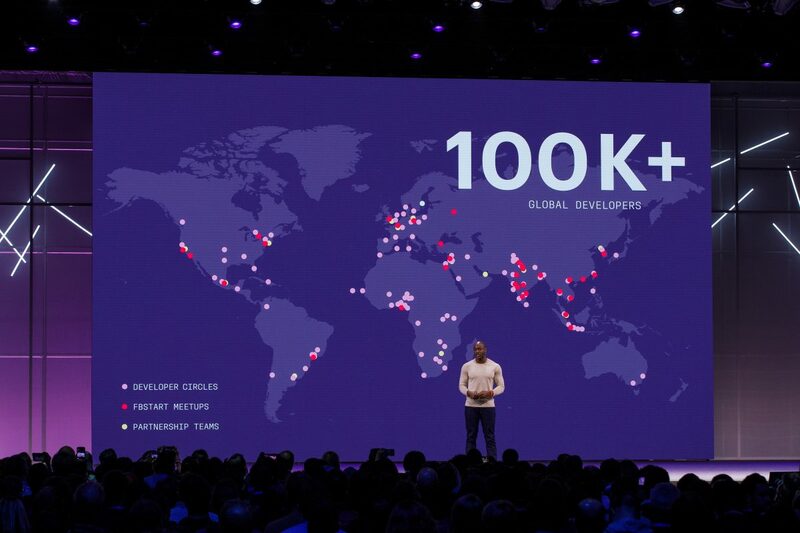 With the experience of building data centers all over the world, Facebook cooperates with local operators and tries to provide cheap and fast internet connection as wide as possible with its Connectivity project. Facebook also tries to highlight another very important topic related to our safety. It is AI ethics. Recently, almost every day we are on the technological edge. With the solutions which we sometimes don’t follow, sometimes don’t understand. Sometimes they are far beyond our reasoning. There are more and more systems which have an immediate impact on us — like the solutions that power hiring process, financial services, justice and countless others. Now we need to be sure that we still can control and understand them. Facebook tries to approach AI ethics from different angles. By promoting diversity and bringing more points of view to be sure that AI solutions aren’t biased by too narrow group of AI teachers. Or by building tools like Fairness Flow to measure how algorithms interacts with different people. And this is just the beginning of their investments, processes, and solutions. But there will never be enough of work with data privacy, AI ethics, and our safety. Especially in the world where information can be worth more than anything else. 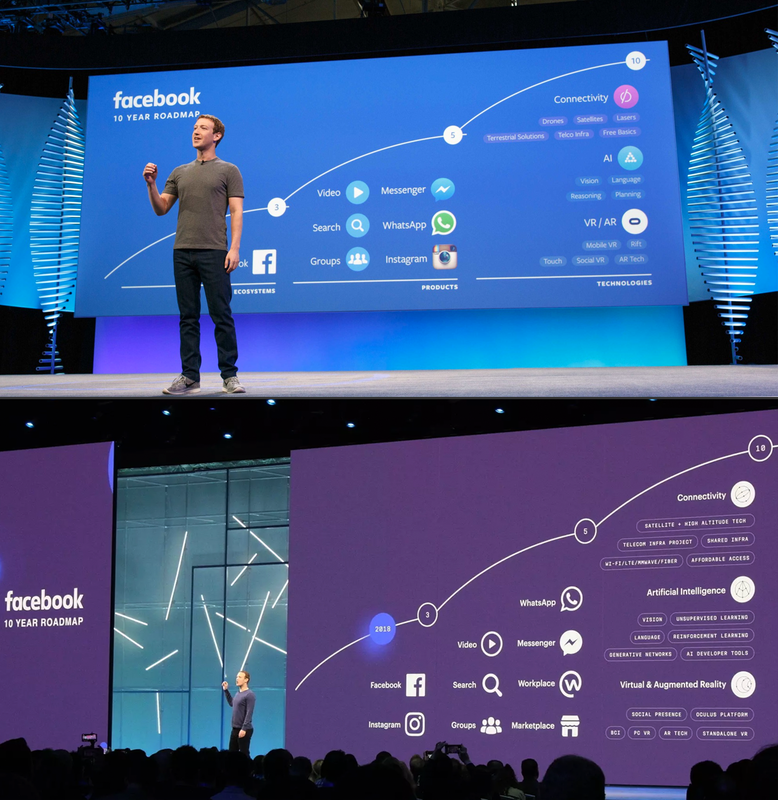 If you want to dive deeper into recent achievements if Facebook’s developers and researchers teams, take a look at the video from day 2 Keynote of F8 conference or Highlights from Day 2. Previous Previous post: Why you do the code?